As Pissarro grew older he became increasingly restless. In the last few years of his life he was continually travelling to find new subjects and motifs. In 1884, Pissarro and his family moved from his home near Pontoise to Éragny on the River Epte, near Gisors. This was to be his principal place of residence until his death in 1903. 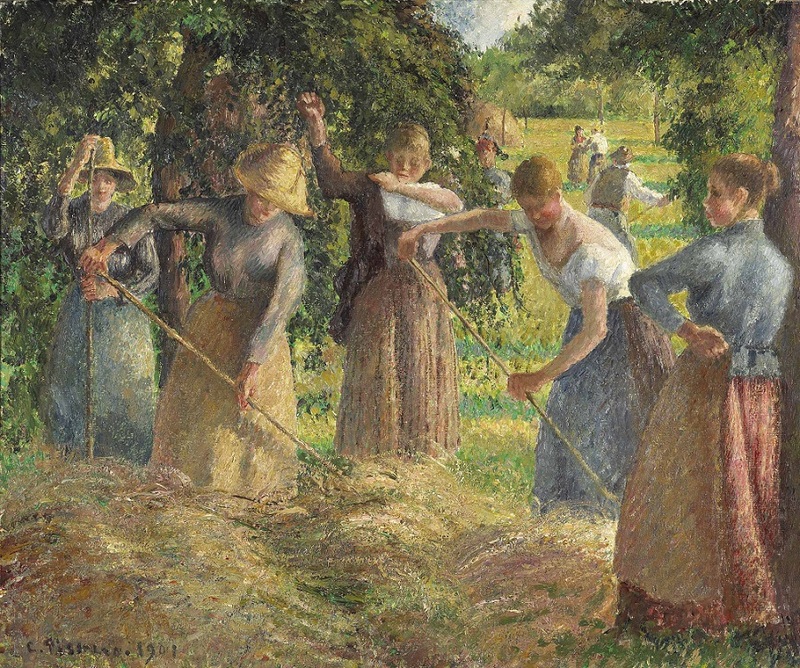 Pissarro started concentrating on the everyday tasks of the rural French community during his stay at Piette's farm at Monfoucault in 1875. However, whereas in the mid 1870s his peasants and cowgirls were generally merged into their natural surroundings, here they are placed well into the foreground, so that the picture is considered a composition of figures rather than a landscape. The five women in the foreground are very carefully positioned. The three standing figures are placed at intervals with the bending figures between them, creating a rhythmical continuity across the surface of the painting. This serene and undulating composition no longer demonstrates the sociological commentaries which were found in Pissarro's earlier works. Rather it is an idealized view of a harmonious rural world.